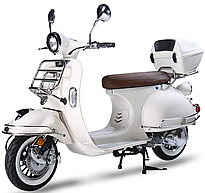 ZNEN VPA 50cc Scooter with Windshield, Remote Start, Anti-theft Alarm, Rear trunk, USB Port, White Wall Tires EPA/DOT/CARB, 99.9% assembled. Free shipping to your door, free helmet and 1 year bumper to bumper warranty. 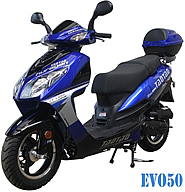 A 50cc version of the VENICE 150, same everything except the engine size and model#. $99.00 a year; $150.00 for 2 years; $199.00 for 3 years (Best Deal). The manufacturer's warranty starts the day when your scooter is delivered. The extended warranty effective as soon as the manufacturer's warranty expires. If you were to add a 3 year extended warranty at only $199, your scooter's motor and other warranty parts will be covered for a total of 4 years. A 50cc motor costs $500 plus shipping, if anything happens during the first 4 years, we will ship you brand new motors free of charge, same way with other warranty parts . Duel Stage Paint Treatment, Beautiful 2-tone colors. And you thought it ended with the fancy exhaust pipe? Nope. This Heritage 150 gas scooter has super stylish 16-spoke rims and white wall tires to complete your fashion needs. Usually when someone refers to something as being "economical" the image of a bare bones, dull, an cheap product come to mind. That's the kind of word you apply to something that you would purchase out of necessity rather than pleasure. Well not anymore. 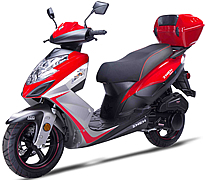 When you purchase the brand new ZNEN VPA-50 scooter, you will be getting something that is definitely economical, but most definitely not dull. 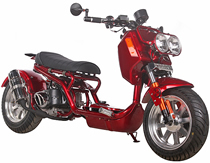 The ZNEN VPA-50 Retro style gas scooter is a 50cc version of the VENICE 150. It is a stylish product well worth the inexpensive price tag. 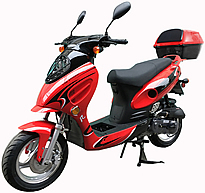 Not only will you be riding this comfortable moped at your leisure, but you'll be saving money and causing jealousy in your neighborhood. 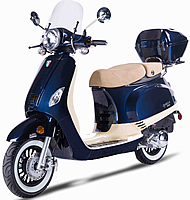 The look and feel of this compact two wheeler will bring you back to the days when Vespa seemed like an inexpensive alternative to the megalomaniacal practices of corporate car manufacturers. Now that time has passed and we need a new scooter with the classic feel of those revolutionary days. Well here it is. Not only will you save money on the purchase, but you will also save at the gas pump. This moped scooter pumps out around 80 to 100 miles per gallon. Compare that to 25 mpg for the average small to mid-sized car. Now you can still get to your destinations, but you'll have a lot more cash on hand to spend on yourself, rather than your commute.